The global law enforcement and firefighting protective clothing fabrics market, which is highly fragmented, is likely to see steady growth in the forecast period from 2016 to 2024. Some of the key organizations such as Milliken & Company, TenCate, National Safety Apparel, and W.L. Gore and Associates are leading the industry. The aforementioned firms together accounted for around 35.0% of the global market. Some of the other prominent players in the market are Glen Raven, Inc., Teijin Aramid B.V., Koninklijke Solvay S.A., PBI Performance Products Inc., and Gunei Chemical Industry Co., Ltd. 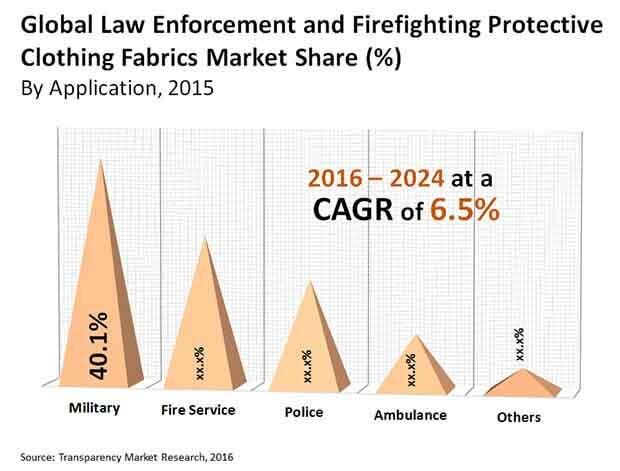 According to a research report by Transparency Market Research (TMR), the global law enforcement and firefighting protective clothing fabrics market is prognosticated to grow with a CAGR of 6.5% within the forecast period from 2016 to 2024, as far as value is concerned. The market was valued around US$954.6 mn in year 2015. This figure is likely to reach US$1.67 bn by the end of 2024. Geographically, North America and Europe are expected to lead the global market. This is due to high quality standards and pressure on players to deliver superior products. On the basis of application, the market is segmented into ambulance or EMT, police, fire service, and military. Among these, the military segment is likely to generate maximum demand. It held around 40.0% share in the overall market in 2015. One of the key factors hampering the global law enforcement and firefighting protective clothing fabrics market is the high cost these fabrics. Unlike conventional material, these fabrics require a comparatively more intense and complicated arrangement of weaving and chemicals to manufacture. This along with the stringent testing procedures makes their production expensive, which in turn serves to push up their market price. In addition, the main softwares and technologies utilized in making law enforcement and firefighting protective clothing fabrics are extremely costly and proprietary, thus resulting in steep upfront investment. This creates high entry barriers for aspiring players. The global law enforcement and firefighting protective clothing fabrics market is additionally being smothered by the worldwide absence of support and enforcement of regulations and controls by the government of developing economies. The emerging economies are anticipated to offer maximum scope of advancements to players in the global law enforcement and firefighting protective clothing fabrics market. Over the coming years, the developing industrial framework and growth in defense industry are anticipated to offer strong growth opportunities for various players in the market. The growing economies are anticipated to end up being main suppliers of high-end scope of advancements in the global law enforcement and firefighting protective clothing fabrics market. Over the coming years, the developing industrial framework and growth defense industry are anticipated to undoubtedly offer strong growth opportunities for various players in the market.